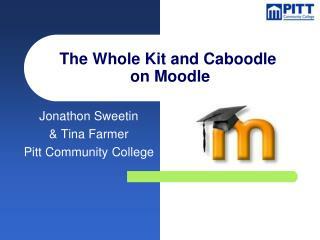 Individualized Education Program: a written educational plan for a child with a disability. 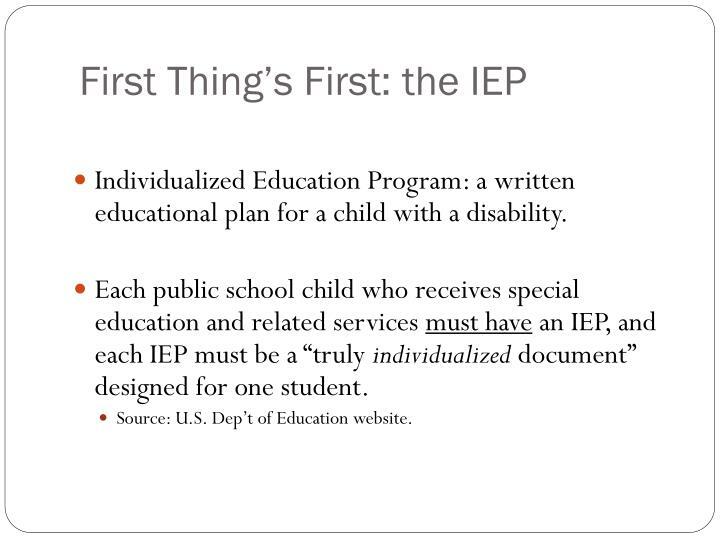 Each public school child who receives special education and related services must have an IEP, and each IEP must be a “truly individualized document” designed for one student. 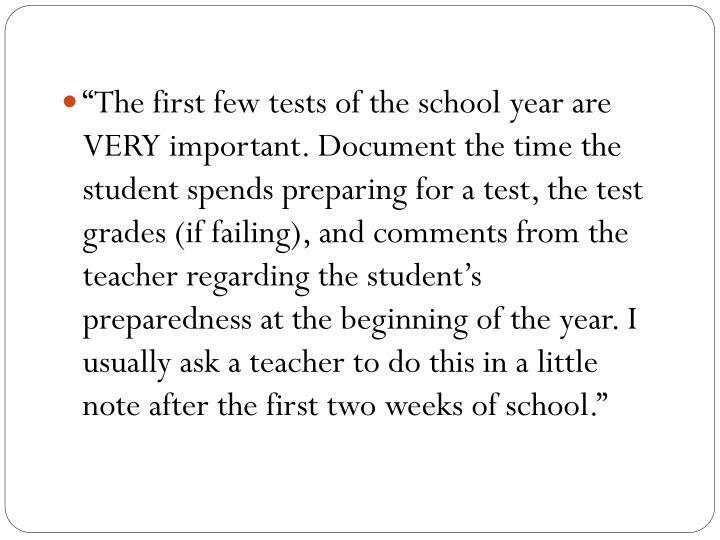 Source: U.S. Dep’t of Education website. 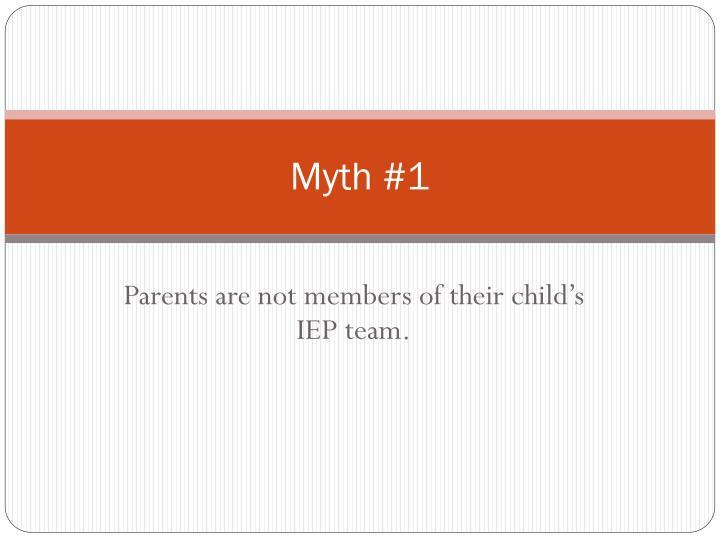 Parents are not members of their child’s IEP team. A parent is one of the most important team members! 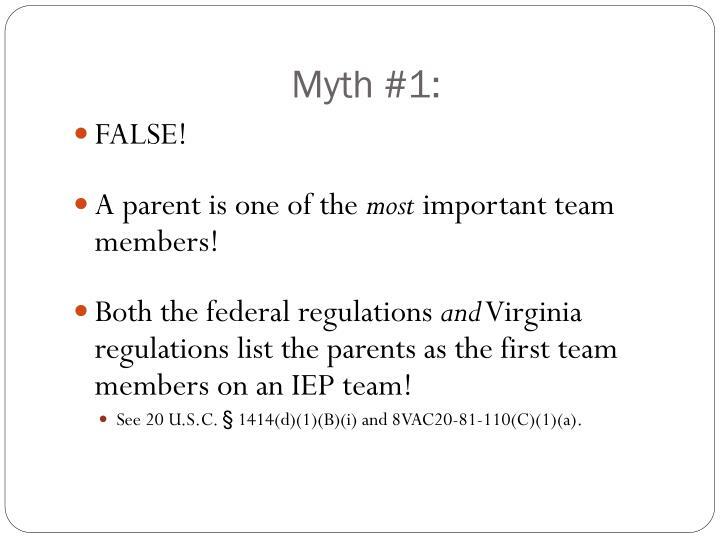 Both the federal regulations and Virginia regulations list the parents as the first team members on an IEP team! See 20 U.S.C. § 1414(d)(1)(B)(i) and 8VAC20-81-110(C)(1)(a). 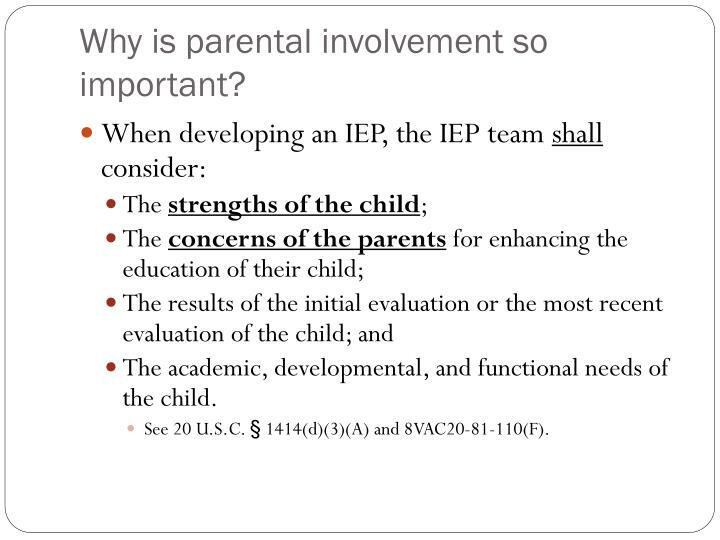 Why is parental involvement so important? See 20 U.S.C. § 1414(d)(3)(A) and 8VAC20-81-110(F). 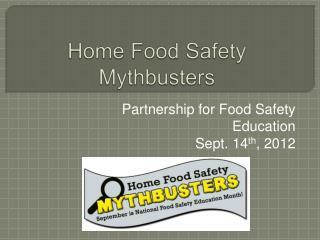 Bring a friend (but inform the school)! 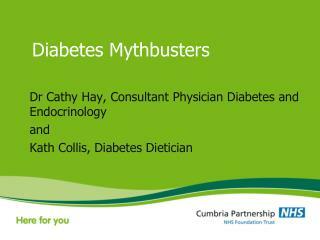 This can be a friend, family member, advocate, tutor, professional consultant, religious leader, etc. 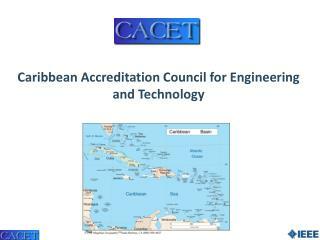 Obtain copies of the evaluations prior to the meeting. Ask to see a draft of the IEP ahead of time. 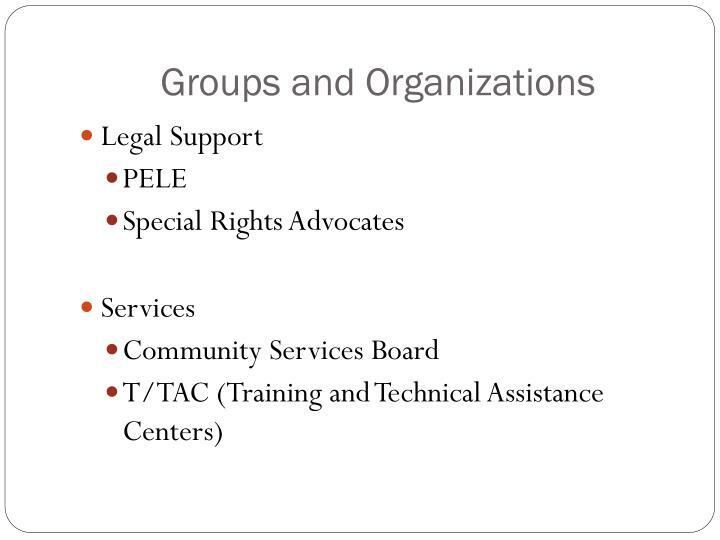 Source: All About IEPs, Peter W. D. Wright, Pam Darr Wright, Sandra Webb O’Connor (Harbor House Law Press, Inc. 2010). A parent has to sign an IEP even if they do not agree with it. 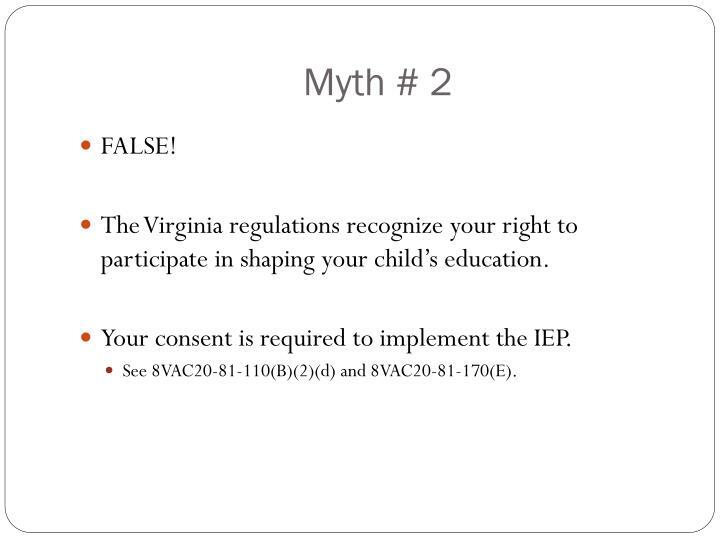 The Virginia regulations recognize your right to participate in shaping your child’s education. 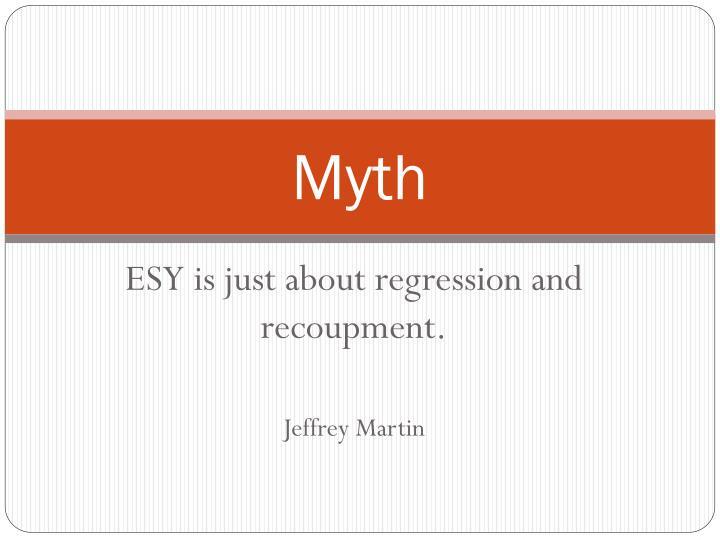 Your consent is required to implement the IEP. “Consent” must be fully informed, which means the school has to make sure you understand what you are giving consent for. 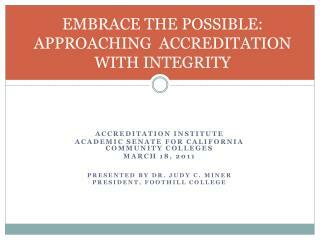 The school must obtain your consent before evaluation, reevaluation, or placement in special education. 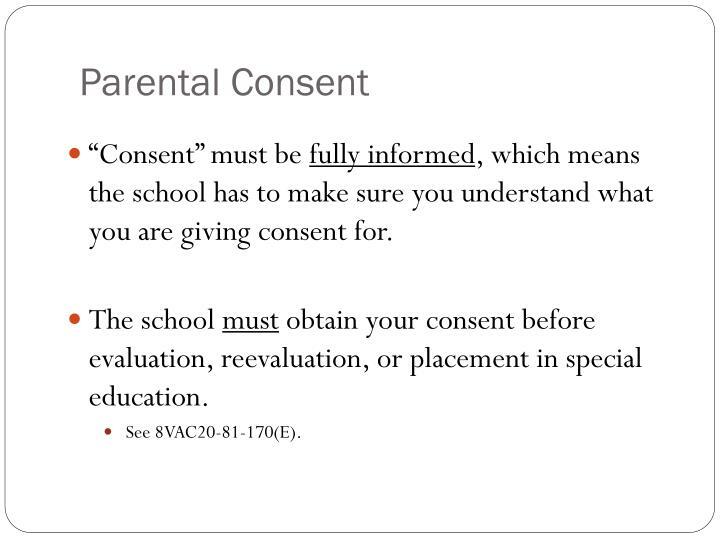 Granting your consent is voluntary; the school cannot force you to give consent! You may revoke your consent (in writing) at any time! 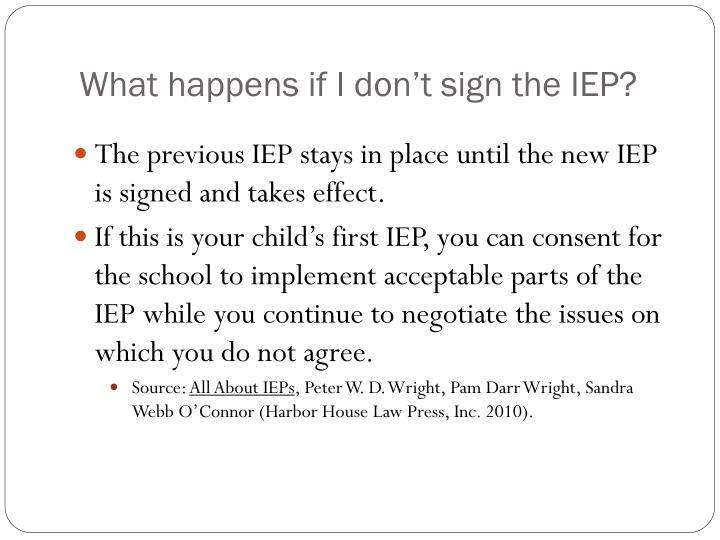 What happens if I don’t sign the IEP? 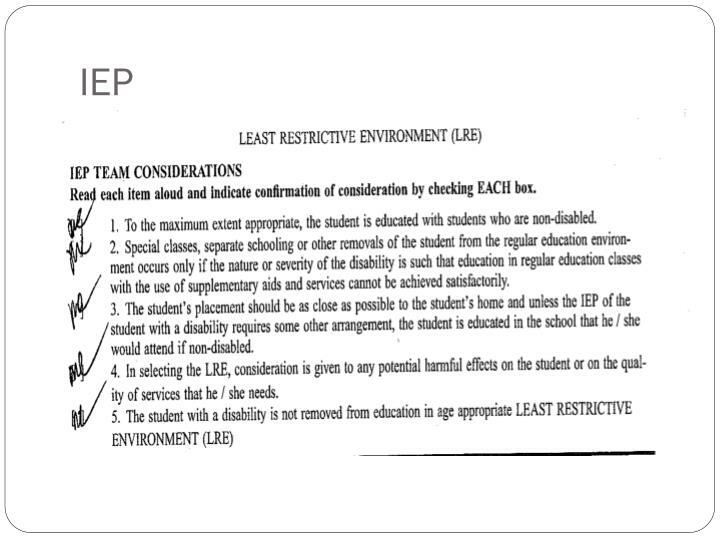 The previous IEP stays in place until the new IEP is signed and takes effect. 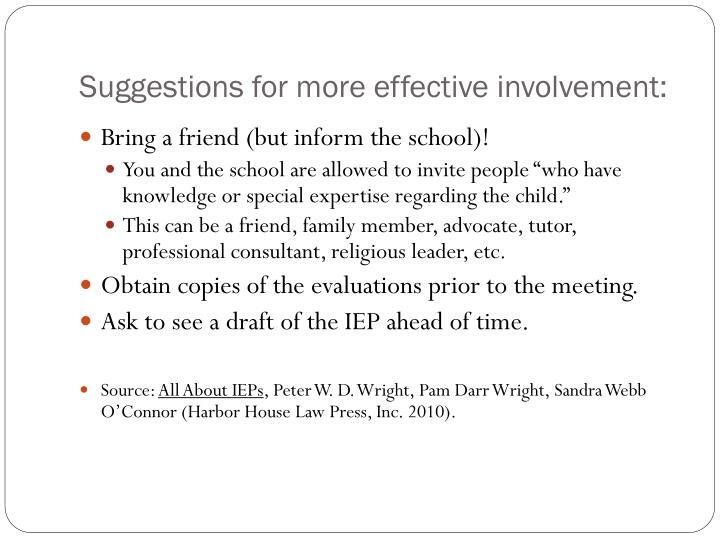 If this is your child’s first IEP, you can consent for the school to implement acceptable parts of the IEP while you continue to negotiate the issues on which you do not agree. Once an IEP is signed and implemented, it is set in stone and cannot be changed. 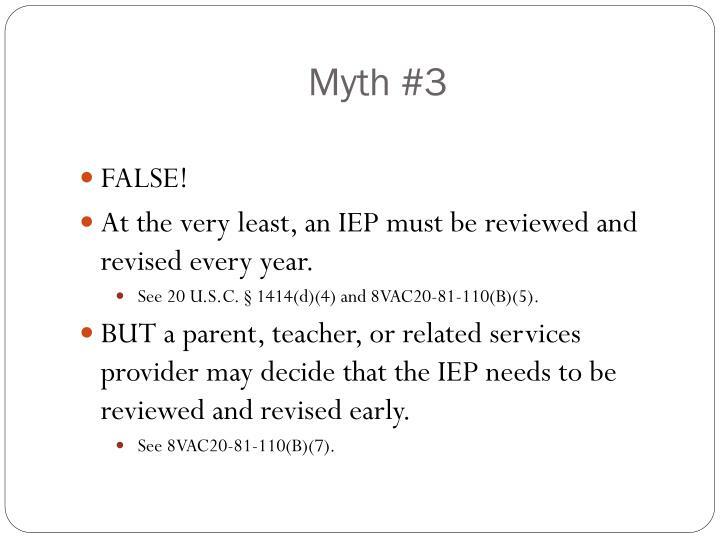 At the very least, an IEP must be reviewed and revised every year. See 20 U.S.C. § 1414(d)(4) and 8VAC20-81-110(B)(5). 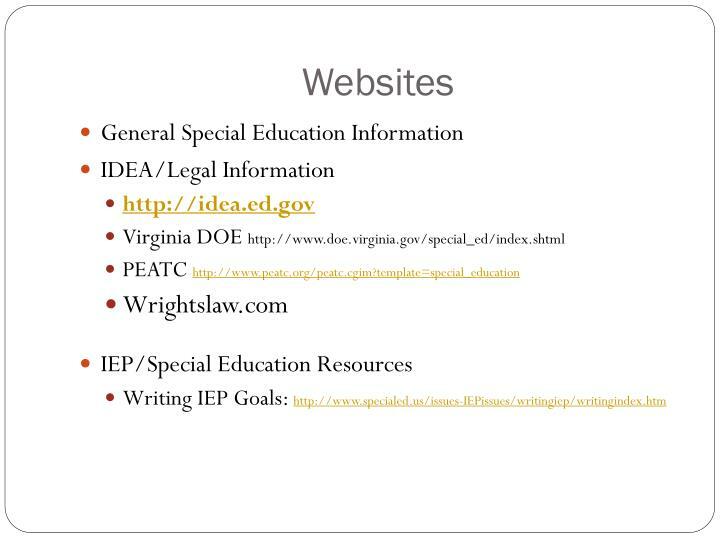 BUT a parent, teacher, or related services provider may decide that the IEP needs to be reviewed and revised early. 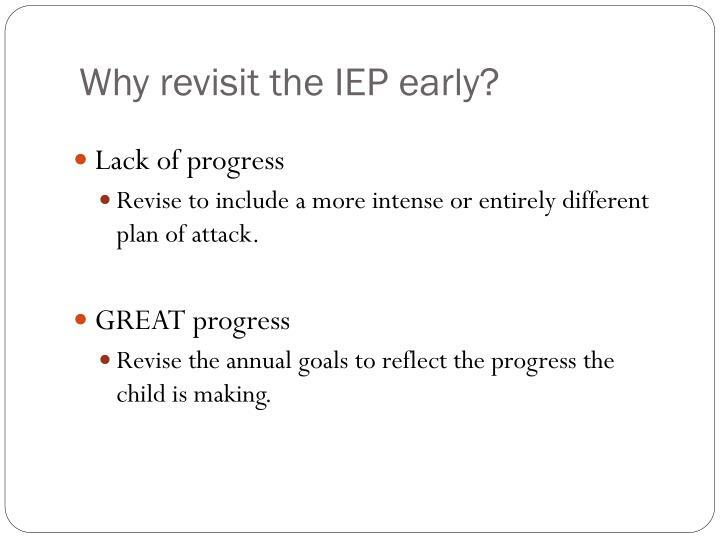 Why revisit the IEP early? 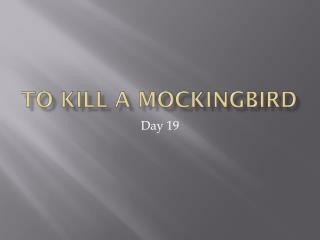 Revise to include a more intense or entirely different plan of attack. 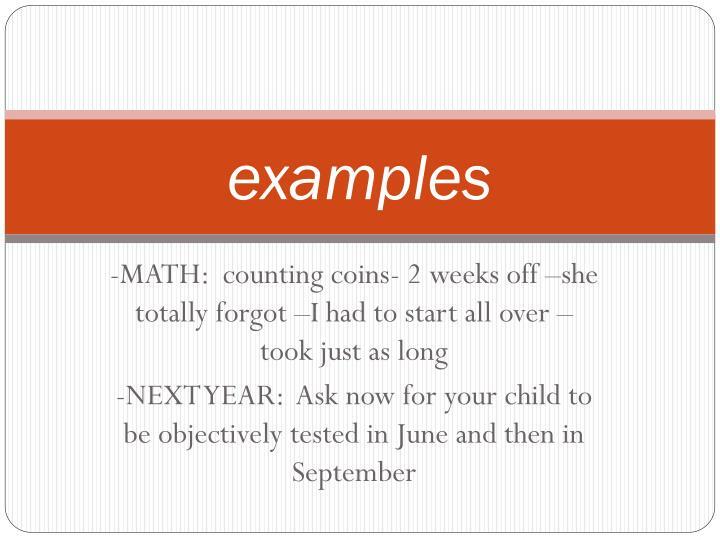 Revise the annual goals to reflect the progress the child is making. 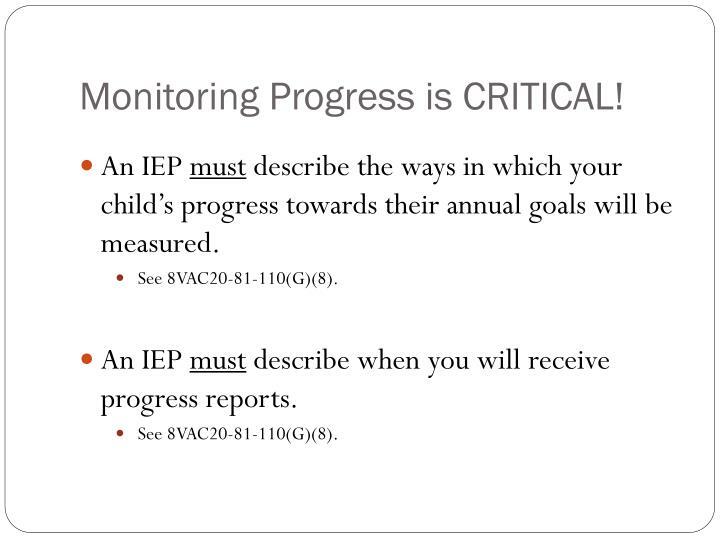 An IEP must describe the ways in which your child’s progress towards their annual goals will be measured. 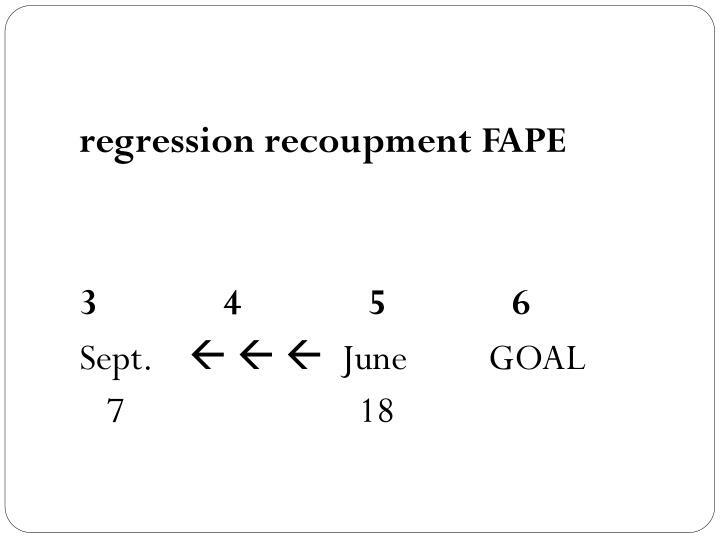 An IEP must describe when you will receive progress reports. The school can change my child’s IEP at any time. Consent is required. 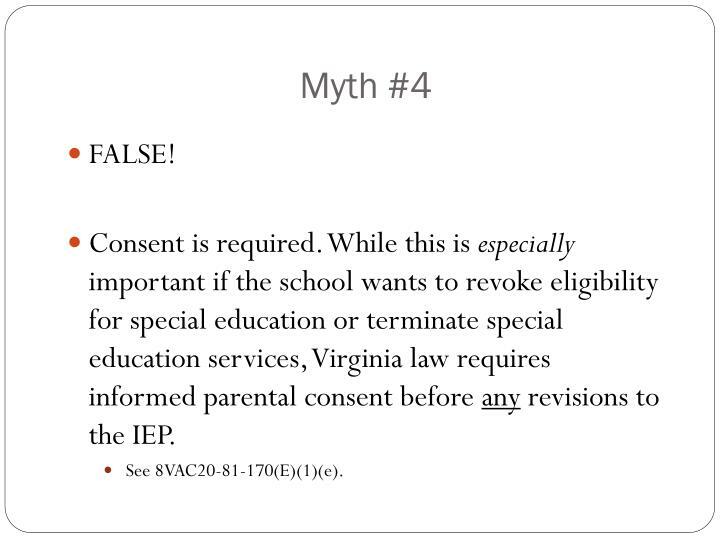 While this is especially important if the school wants to revoke eligibility for special education or terminate special education services, Virginia law requires informed parental consent before any revisions to the IEP. 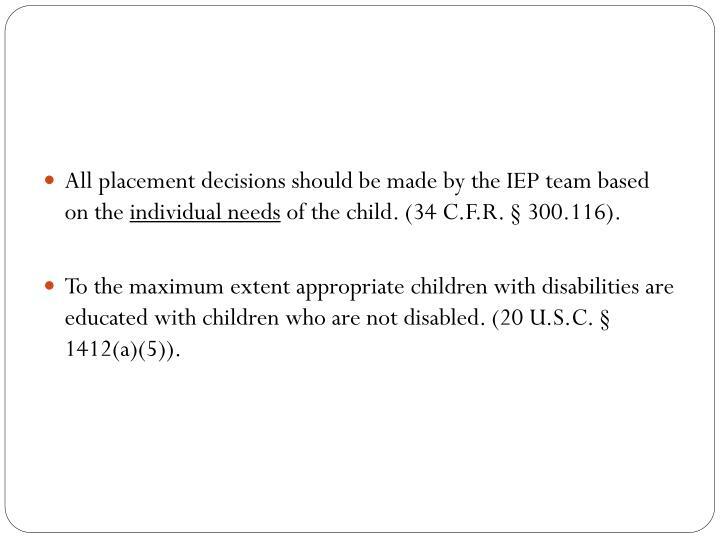 All placement decisions should be made by the IEP team based on the individual needs of the child. 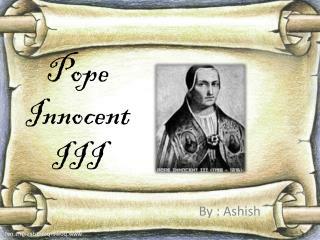 (34 C.F.R. § 300.116). To the maximum extent appropriate children with disabilities are educated with children who are not disabled. 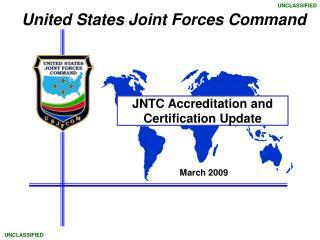 (20 U.S.C. § 1412(a)(5)). 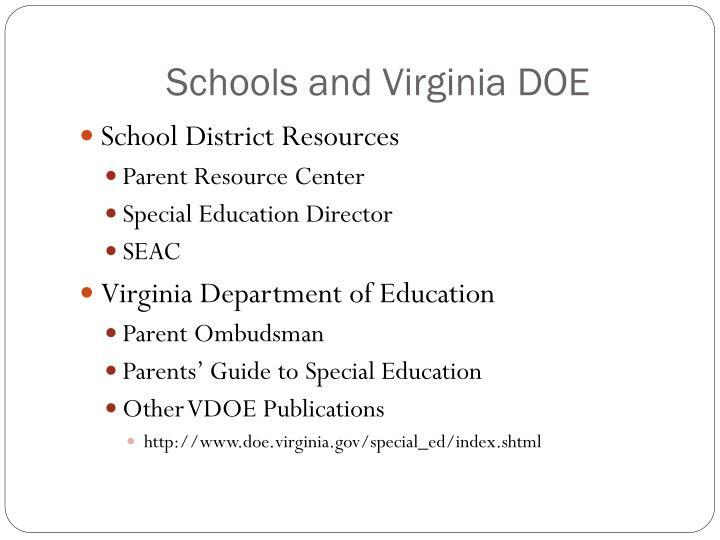 VA has no law on restraint and seclusion that governs the public schools. VA provides schools with recommendations of best policies concerning restraint and seclusion. Any restraint that restricts breathing. 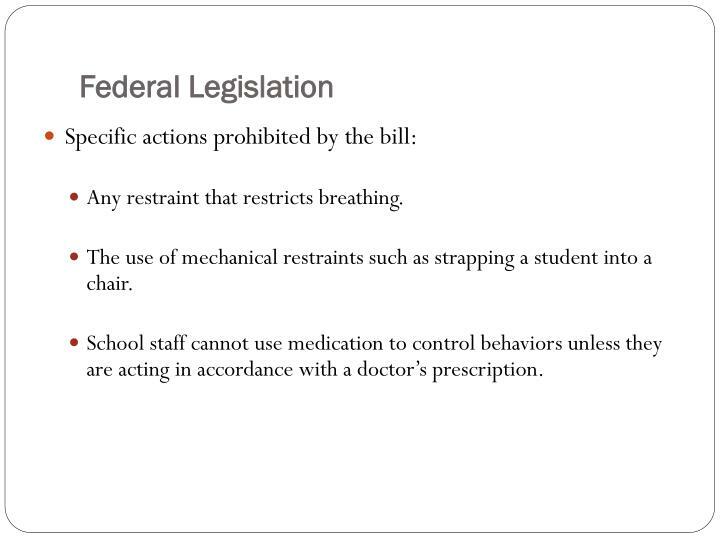 The use of mechanical restraints such as strapping a student into a chair. 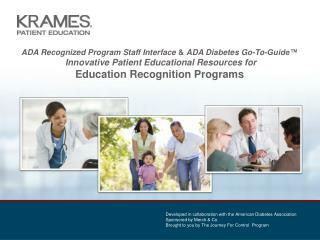 School staff cannot use medication to control behaviors unless they are acting in accordance with a doctor’s prescription. 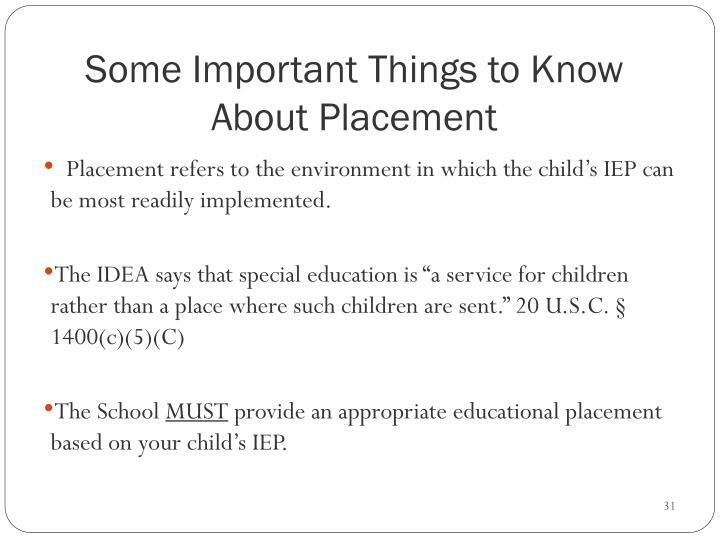 Placement refers to the environment in which the child’s IEP can be most readily implemented. 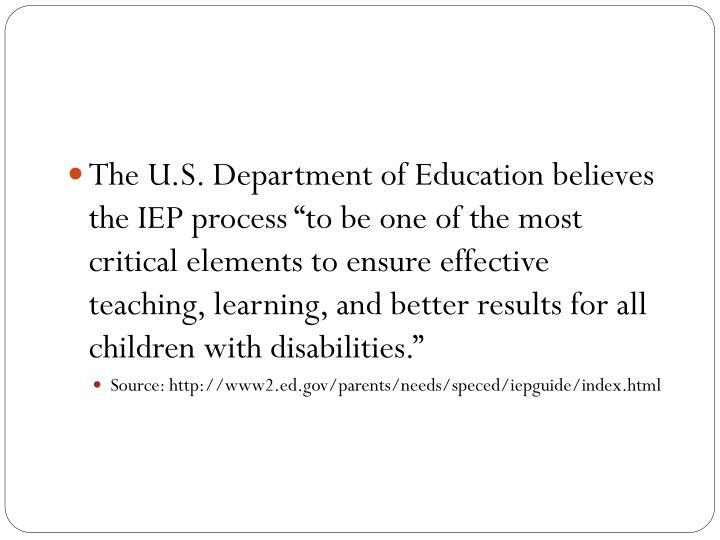 The School MUST provide an appropriate educational placement based on your child’s IEP. When determining a child’s placement, it is typically the school who decides where the IEP will be carried out. 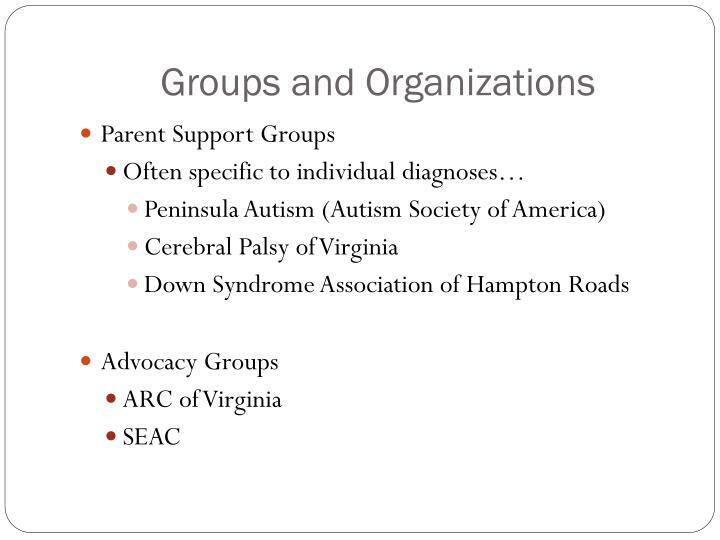 Fact: Parents have the right to be a part of any group that decides the educational placement of the child. Fact: The team must first consider placement in the general education classroom at the school your child would attend if not disabled. 34 C.F.R. § 300.116. Fact: Placement may NOT be based on the child’s disability category or severity of the disability (i.e., children with autism are placed in a designated autism classroom). Placement decisions are made based on the school’s access to special education and related services and the availability of trained staff. 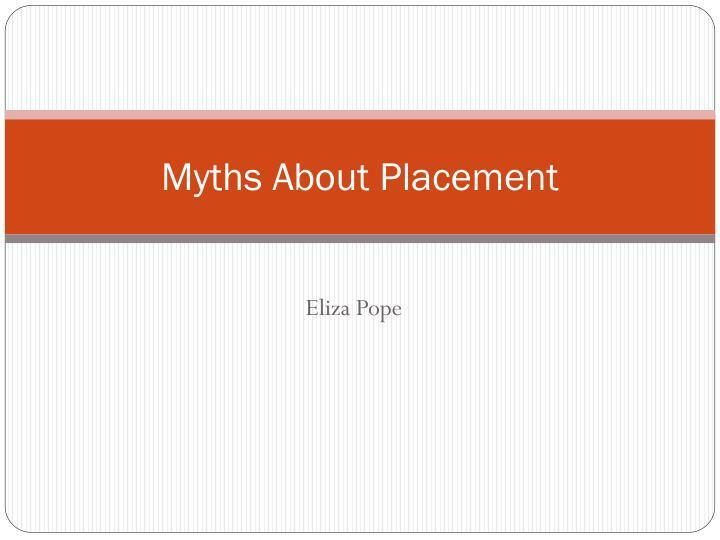 Fact: Placement decisions must be based on the unique needs of the child as documented in the IEP. 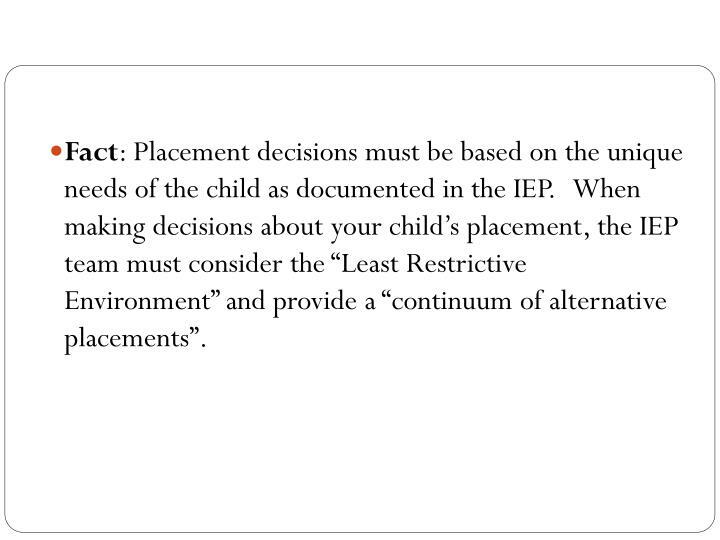 When making decisions about your child’s placement, the IEP team must consider the “Least Restrictive Environment” and provide a “continuum of alternative placements”. 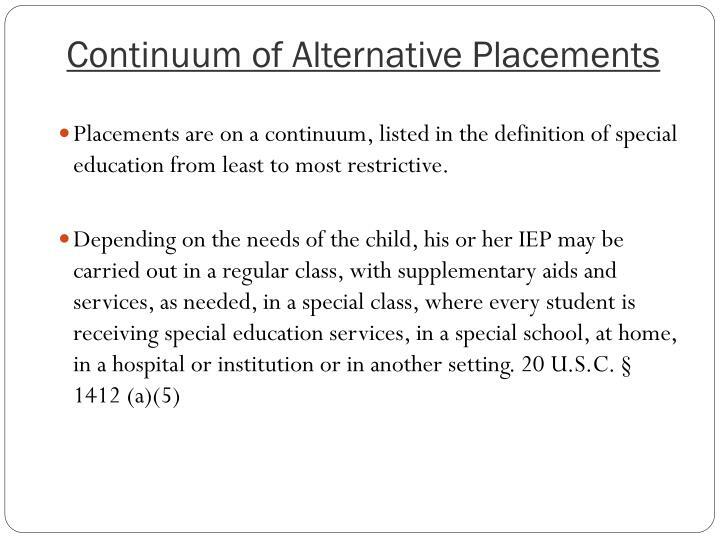 Placements are on a continuum, listed in the definition of special education from least to most restrictive. Children with severe disabilities must be placed in special centers	for disabled children or in private schools. Fact: Your child must be educated with non-disabled children to the maximum extent appropriate to the child’s specific needs. 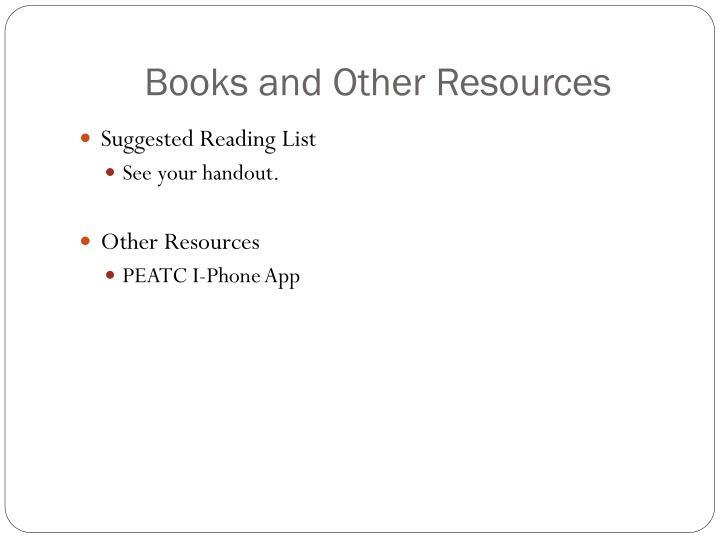 If your child could make reasonable progress in her IEP goals in a regular classroom, the school must provide whatever additional services are necessary for your child to succeed. 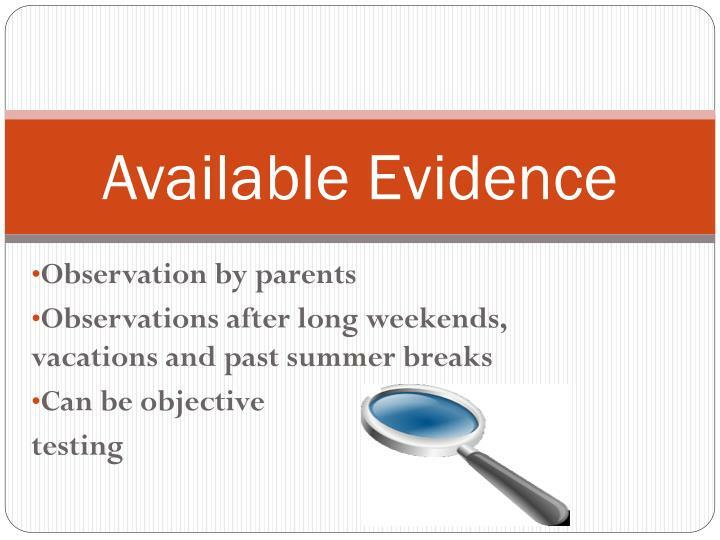 The team may determine that the most appropriate placement for your child is outside of your child’s school district. 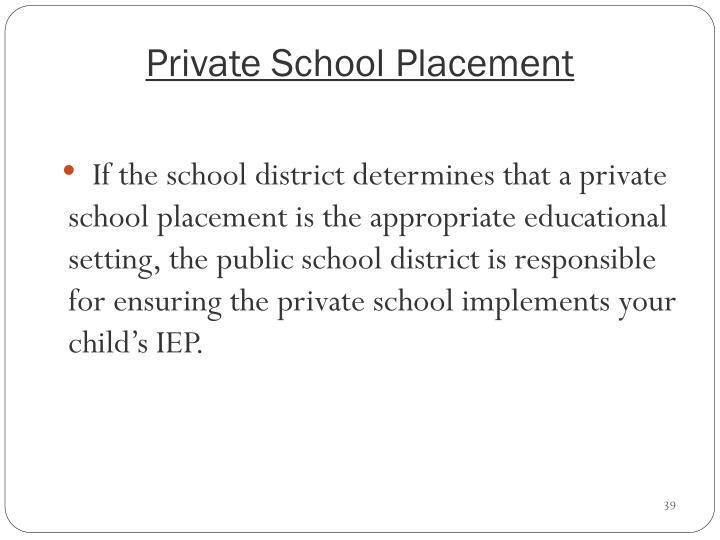 If the school district determines that a private school placement is the appropriate educational setting, the public school district is responsible for ensuring the private school implements your child’s IEP. Once you have approved your child’s Notice of Recommended Educational Placement and IEP, you must wait until the next year to request a change in your child’s program or placement, or go to a due process hearing. Fact: Although the school MUST make a placement determination at least once a year, you are permitted to request a change in your child’s program or placement at any time. 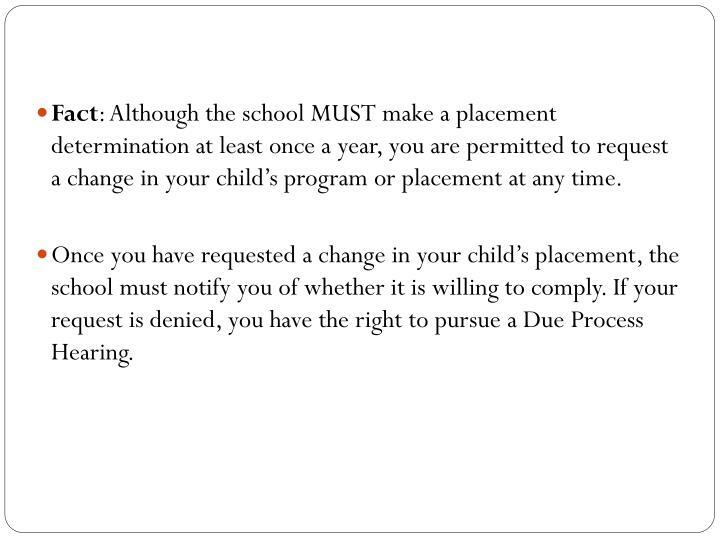 Once you have requested a change in your child’s placement, the school must notify you of whether it is willing to comply. If your request is denied, you have the right to pursue a Due Process Hearing. 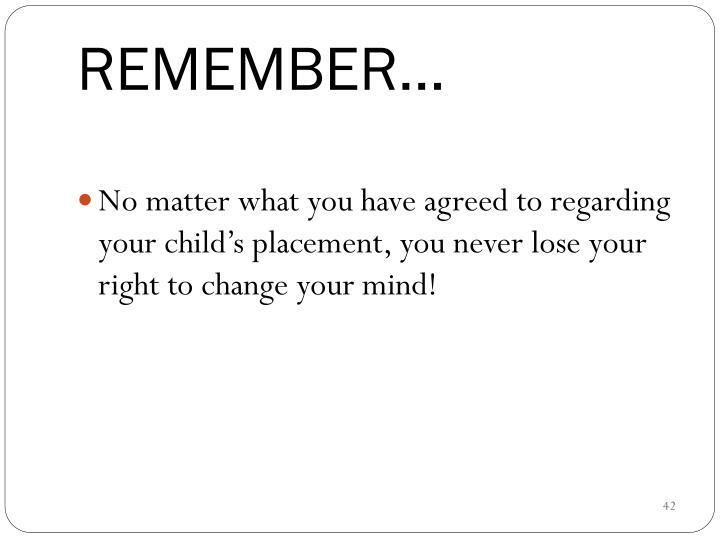 No matter what you have agreed to regarding your child’s placement, you never lose your right to change your mind! 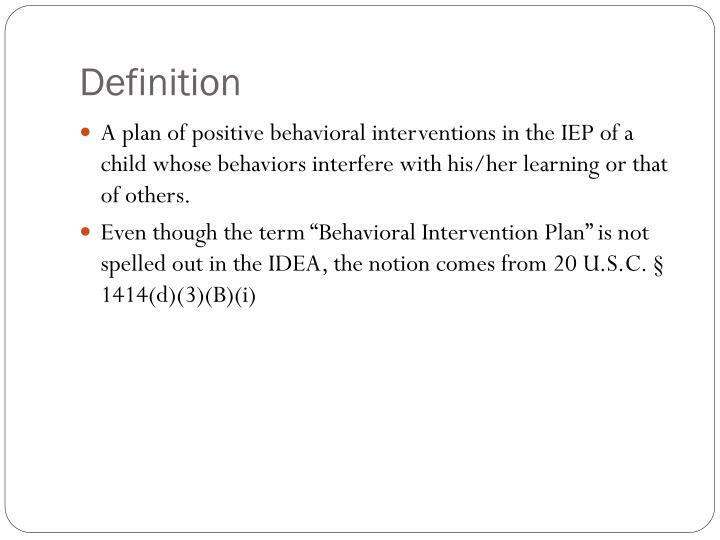 A plan of positive behavioral interventions in the IEP of a child whose behaviors interfere with his/her learning or that of others. The BIP is one of the special factors that should be considered in the development of the IEP. 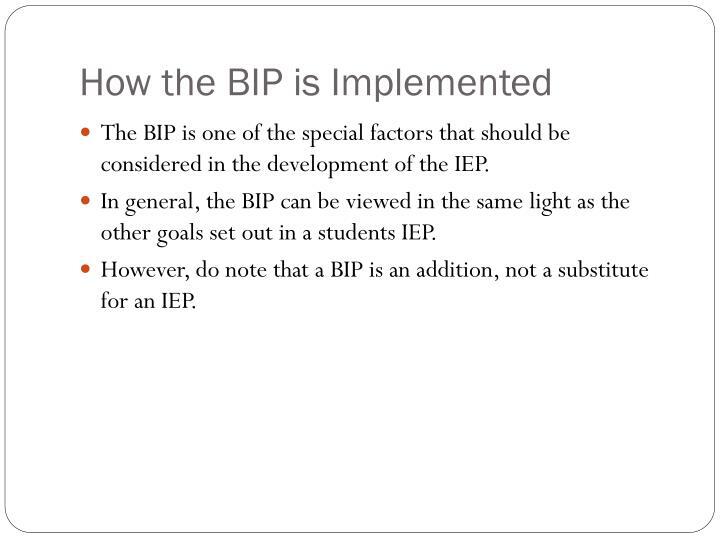 In general, the BIP can be viewed in the same light as the other goals set out in a students IEP. 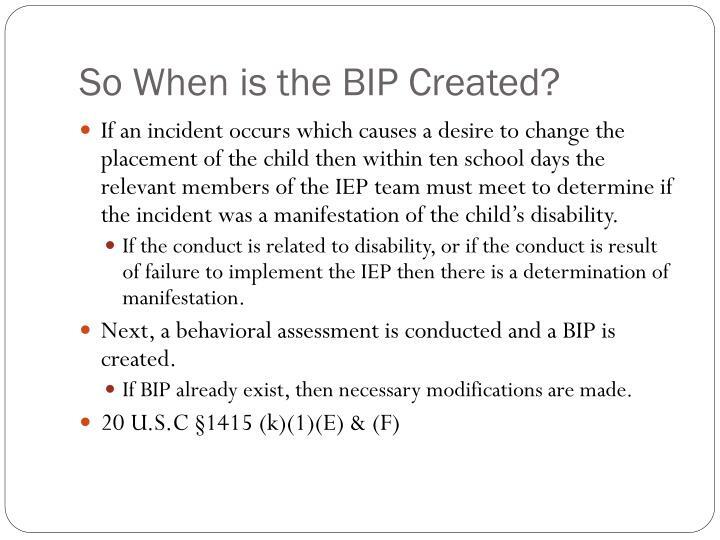 However, do note that a BIP is an addition, not a substitute for an IEP. So When is the BIP Created? 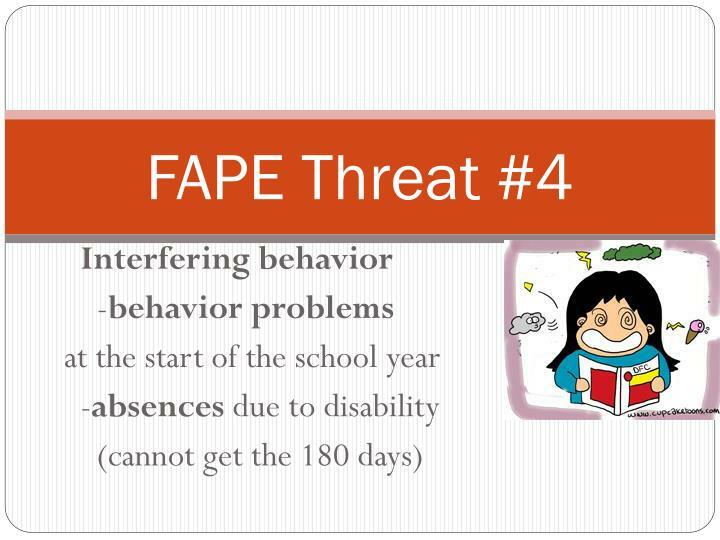 If an incident occurs which causes a desire to change the placement of the child then within ten school days the relevant members of the IEP team must meet to determine if the incident was a manifestation of the child’s disability. 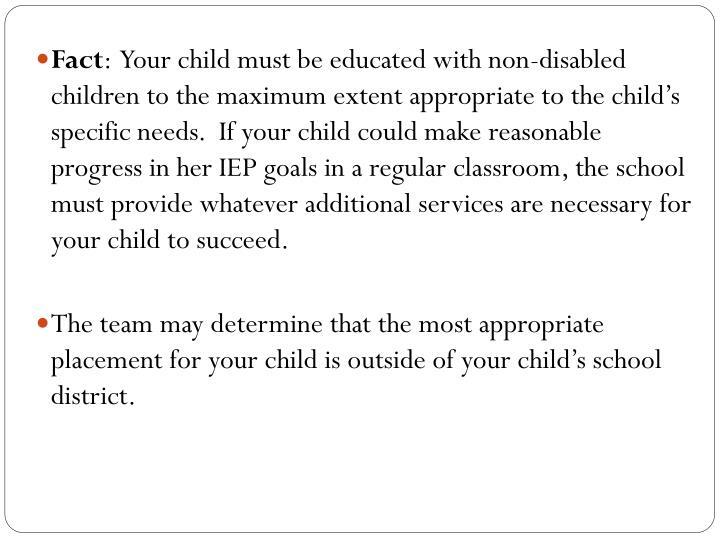 If the conduct is related to disability, or if the conduct is result of failure to implement the IEP then there is a determination of manifestation. 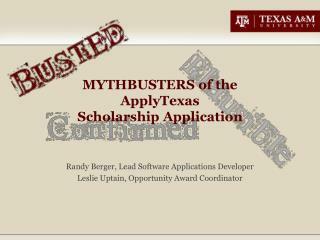 Next, a behavioral assessment is conducted and a BIP is created. 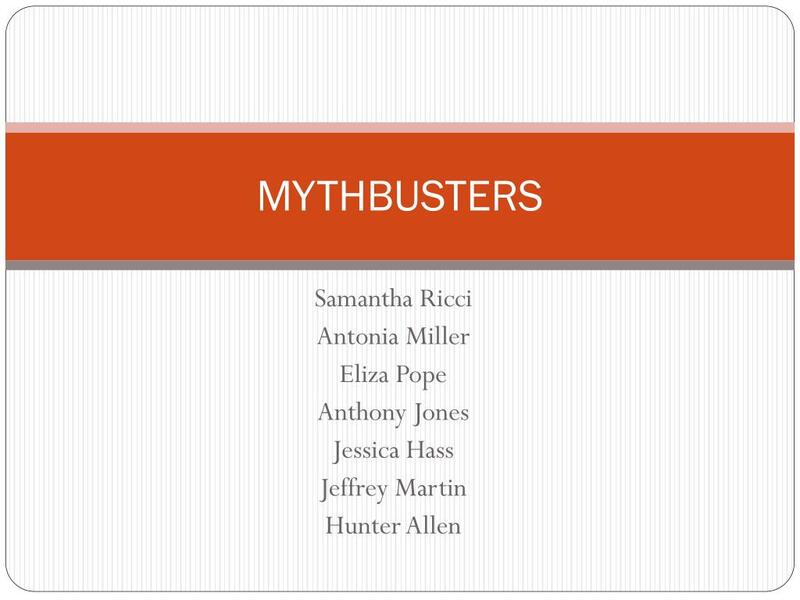 If BIP already exist, then necessary modifications are made. 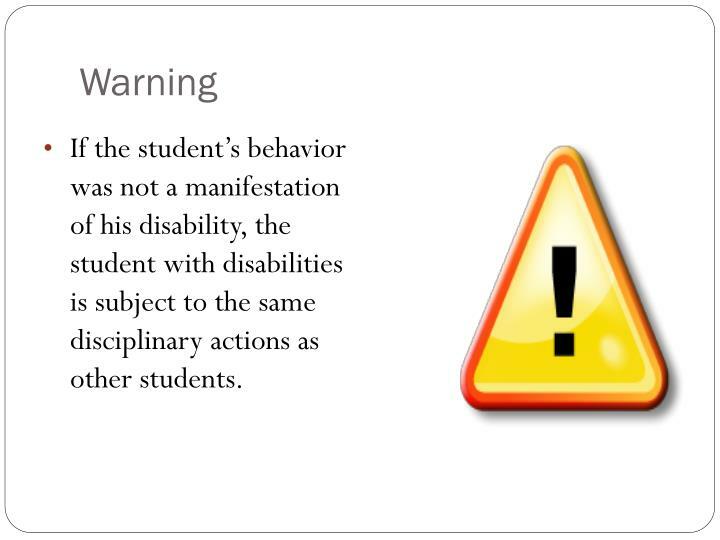 If the student’s behavior was not a manifestation of his disability, the student with disabilities is subject to the same disciplinary actions as other students. 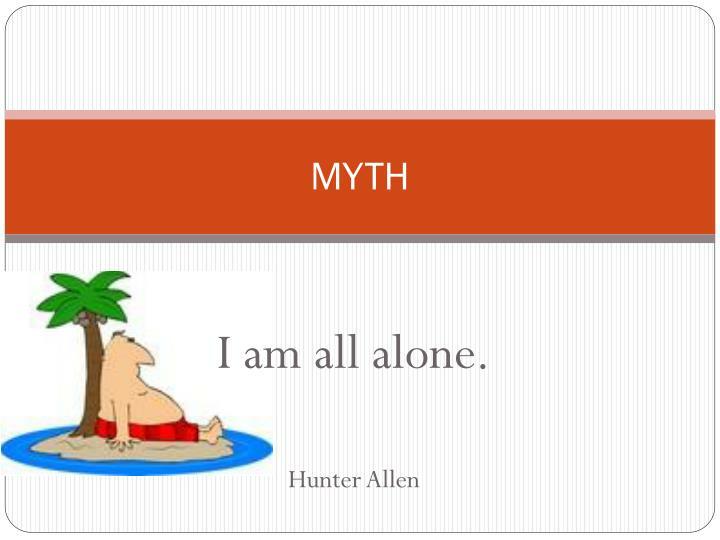 His BIP covers sudden verbal outburst and knocking books off of other students desk. These are manifestations of his disability. 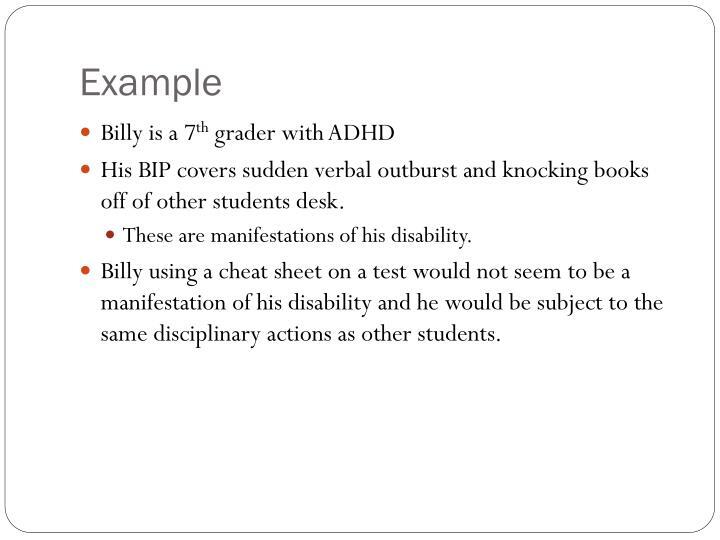 Billy using a cheat sheet on a test would not seem to be a manifestation of his disability and he would be subject to the same disciplinary actions as other students. 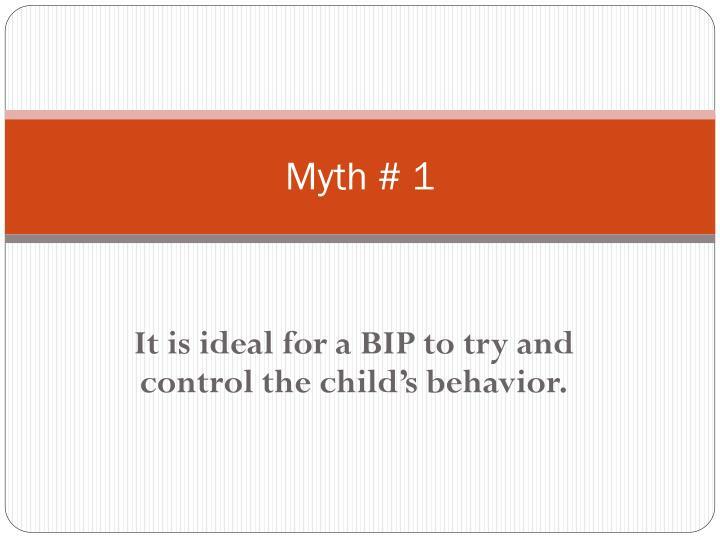 It is ideal for a BIP to try and control the child’s behavior. Interventions based upon control often fail to generalize to that particular behavior, and many times they serve only to suppress the behavior. 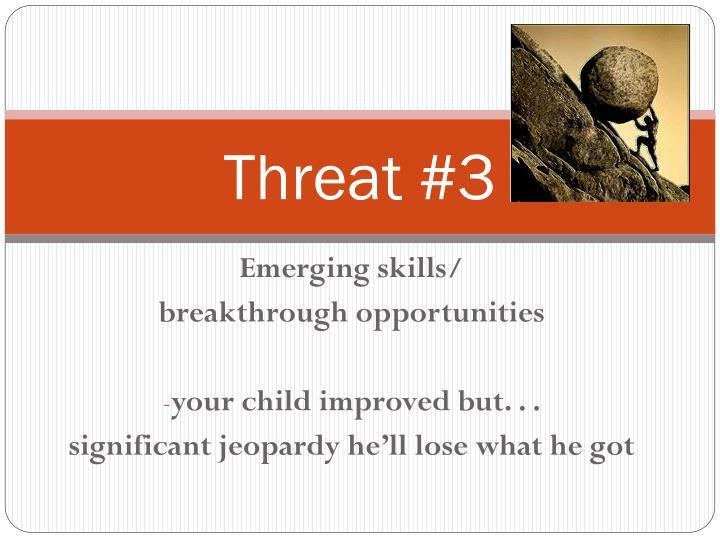 Often this results in a child manifesting unaddressed needs in alternative, inappropriate ways. 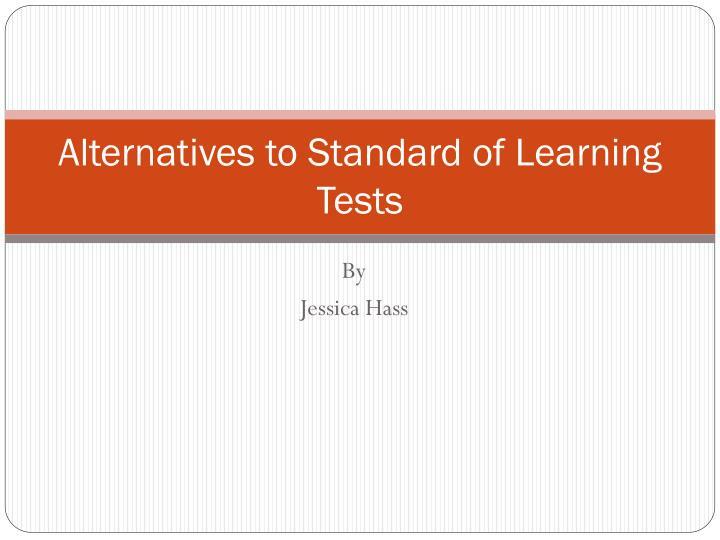 Interventions should emphasize the skills a student will need in order to behave in a more appropriate manner, or provide motivation for the student to conform to required standards. The Child should always be returned to their prior placement if the behavioral problems were determined to be a manifestation of the child’s disability. 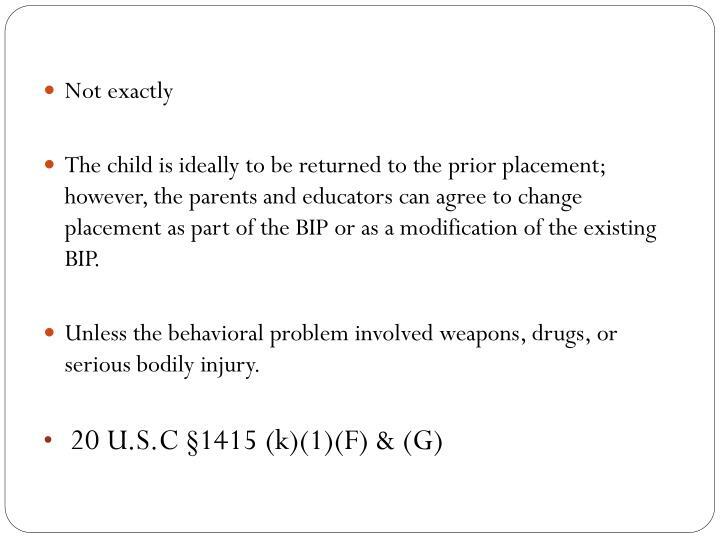 The child is ideally to be returned to the prior placement; however, the parents and educators can agree to change placement as part of the BIP or as a modification of the existing BIP. Unless the behavioral problem involved weapons, drugs, or serious bodily injury. 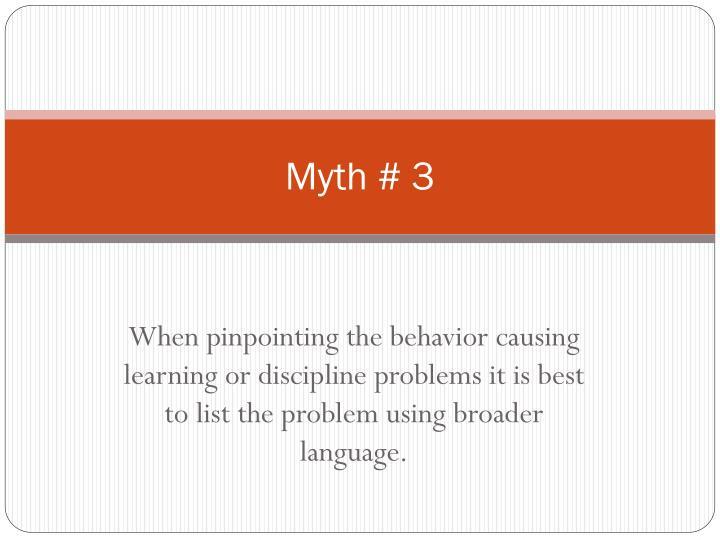 When pinpointing the behavior causing learning or discipline problems it is best to list the problem using broader language. 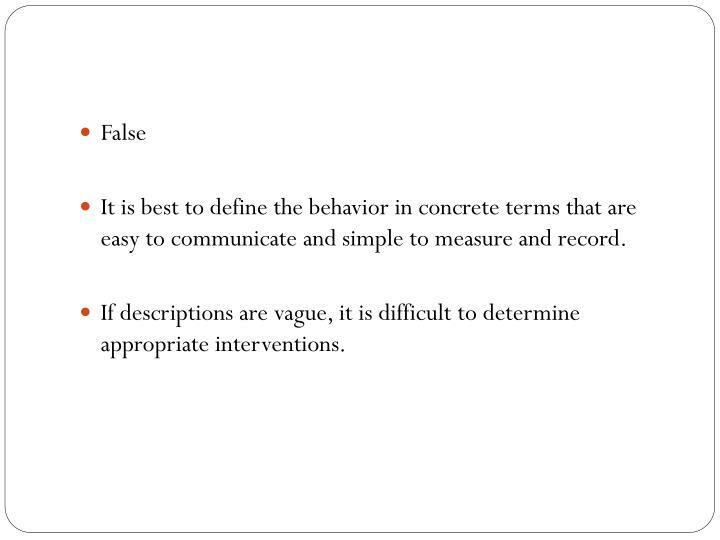 It is best to define the behavior in concrete terms that are easy to communicate and simple to measure and record. 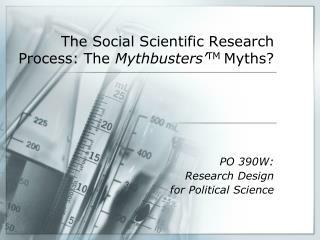 If descriptions are vague, it is difficult to determine appropriate interventions. 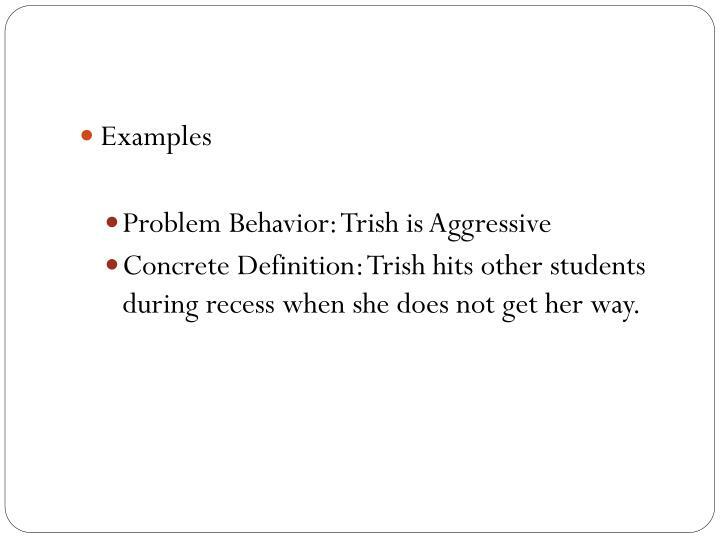 Concrete Definition: Trish hits other students during recess when she does not get her way. BIP’s only address disciplinary problems. 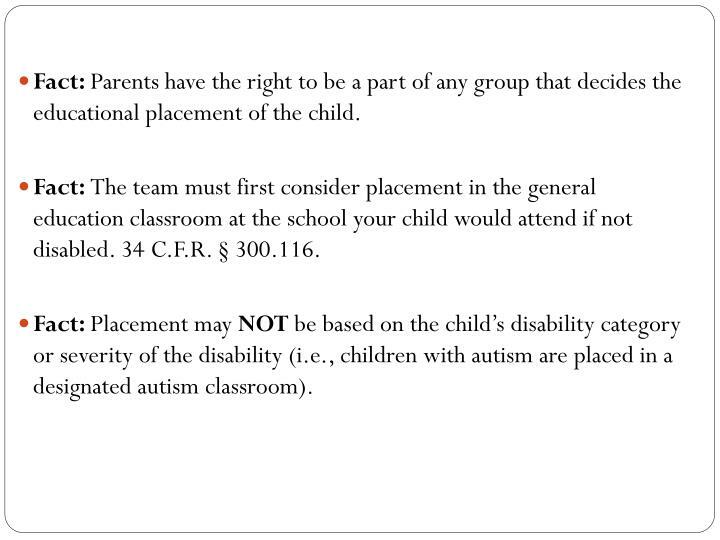 Any action that is in violation of the school’s code of conduct, and could result in a change of placement for the child, is eligible for a manifestation determination. 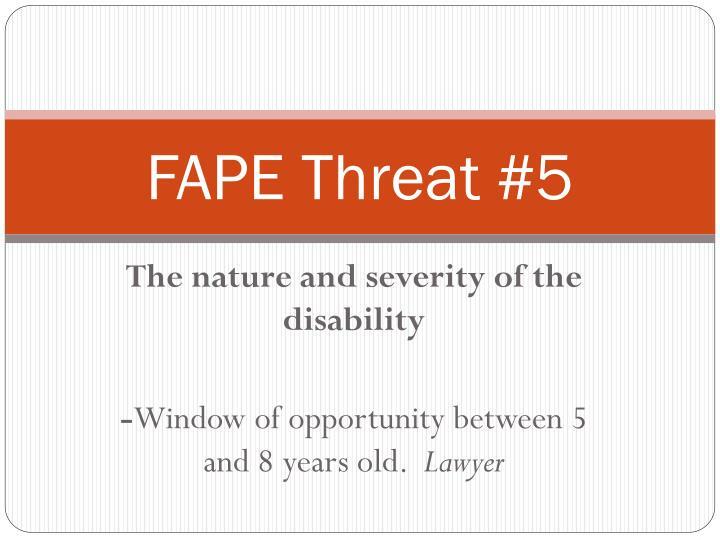 If the action is considered to be a manifestation of the child’s disability then a behavioral assessment must be conducted and a behavioral intervention plan must be created. Standardized tests do not measure the achievements of disabled children. Only students who take the SOLs are eligible to receive a standard diploma. What diploma will my child get? 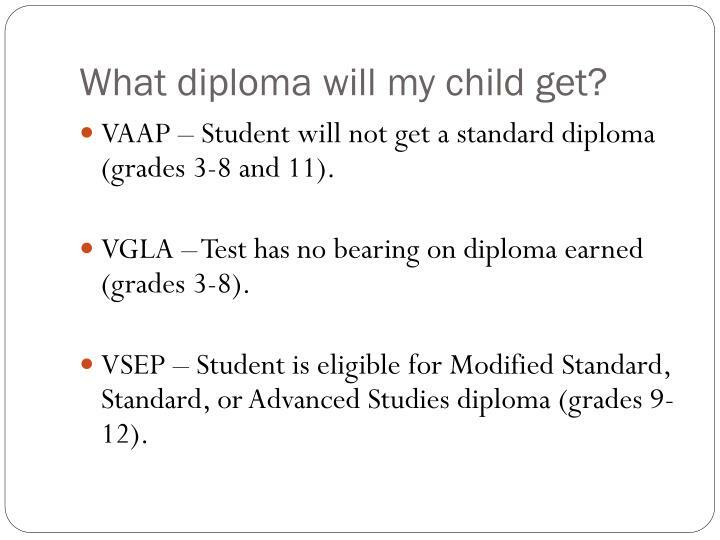 VAAP – Student will not get a standard diploma (grades 3-8 and 11). 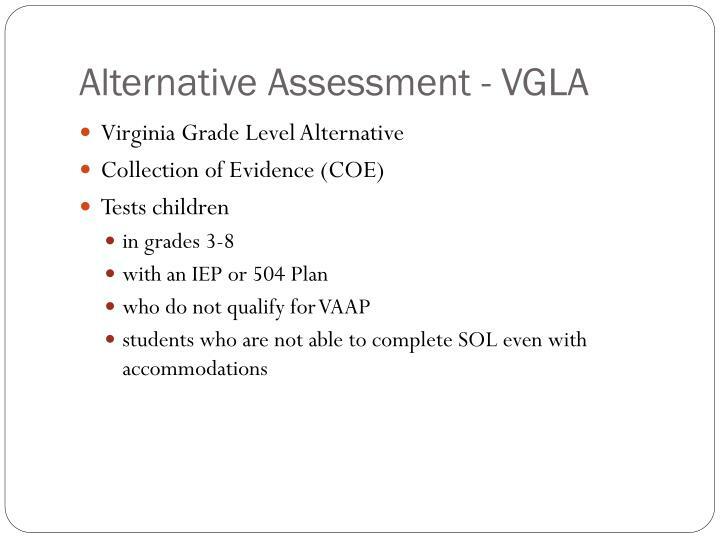 VGLA – Test has no bearing on diploma earned (grades 3-8). 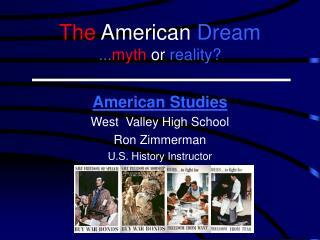 VSEP – Student is eligible for Modified Standard, Standard, or Advanced Studies diploma (grades 9-12). 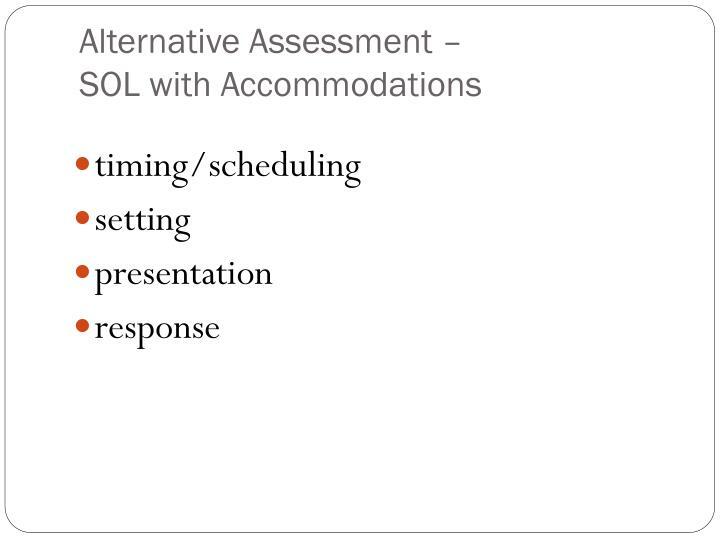 Schools are not held accountable for educating children who do not take the SOLs. 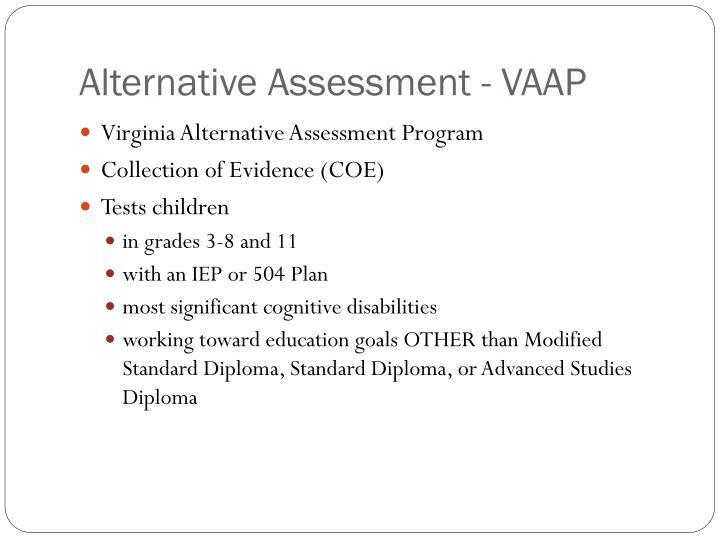 VAAP and VGLA evidence is submitted to the school division and scored locally. 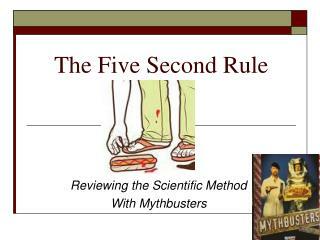 Scoring teams apply a scoring rubric to submitted evidence and enter ratings of student performance in an online scoring system. 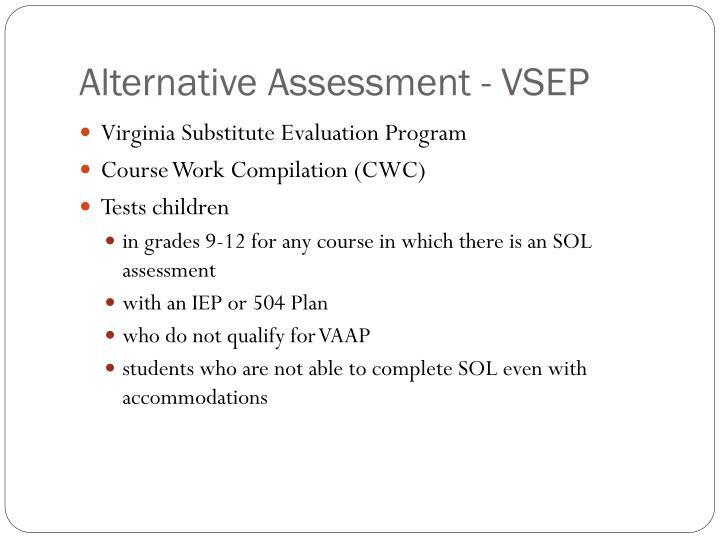 CWC for VSEP is reviewed by individuals who are familiar with the course content area being assessed and the characteristics of the submitting students. 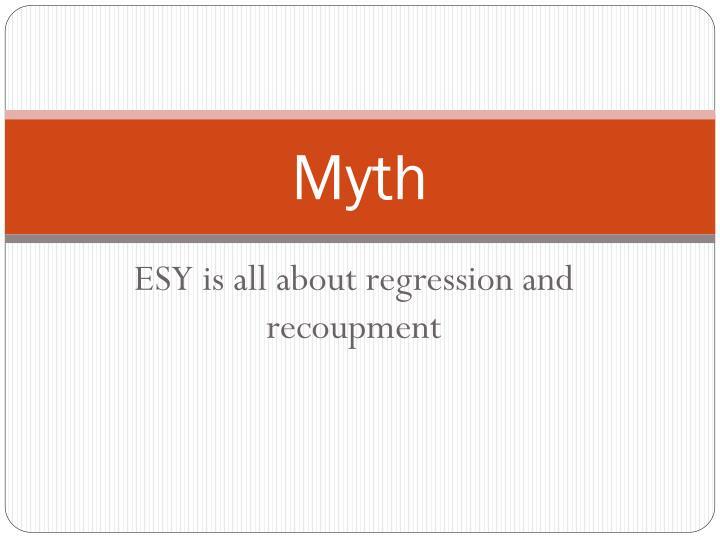 ESY is just about regression and recoupment. Download the manual from the Virginia Department of Education. 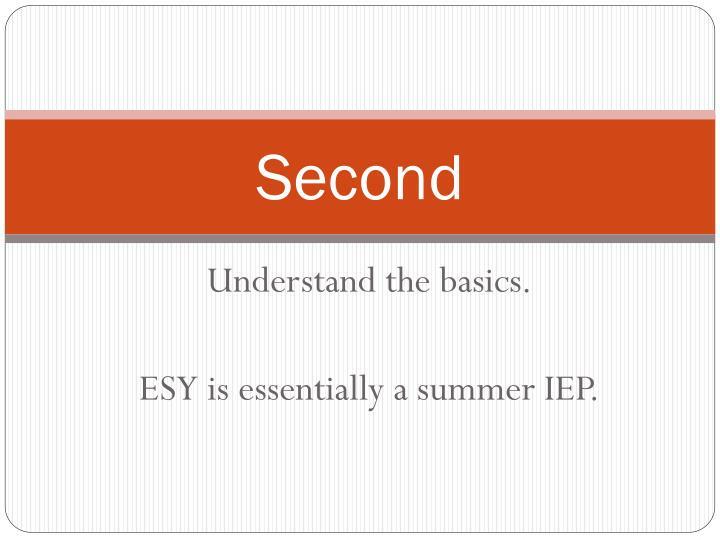 ESY is essentially a summer IEP. 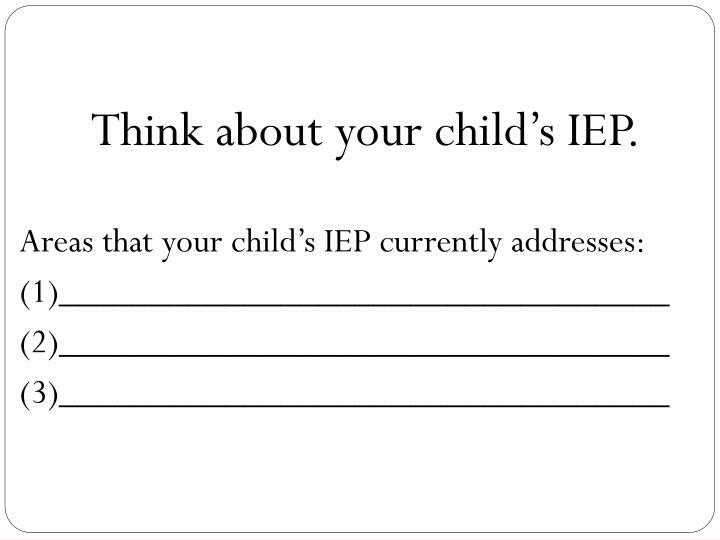 Think about your child’s IEP. 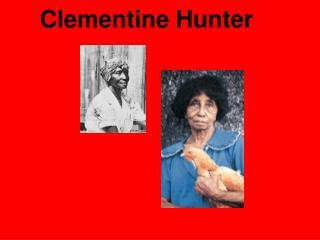 “Historically . 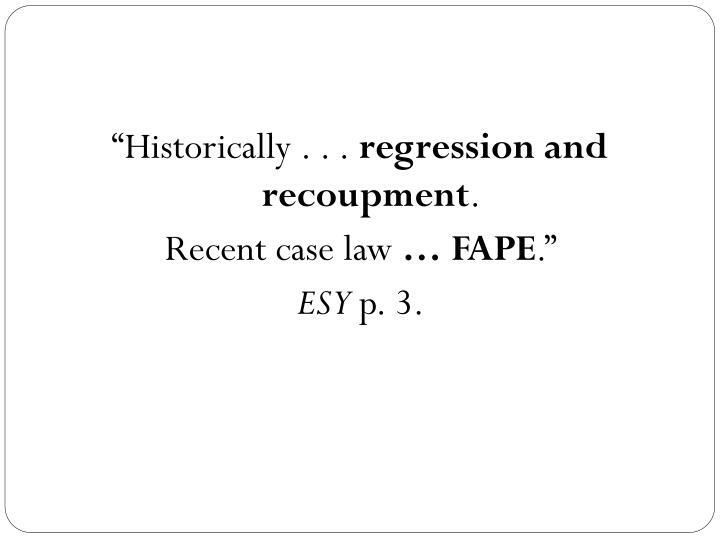 . . regression and recoupment. 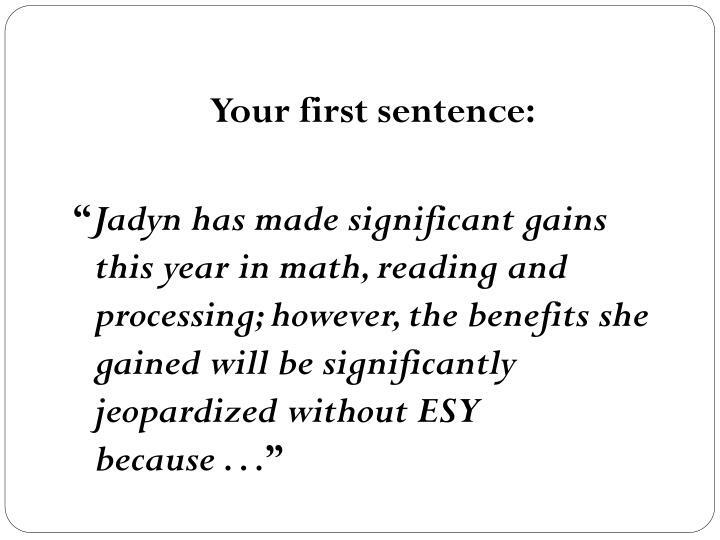 The benefits gained will be significantly jeopardized without ESY. 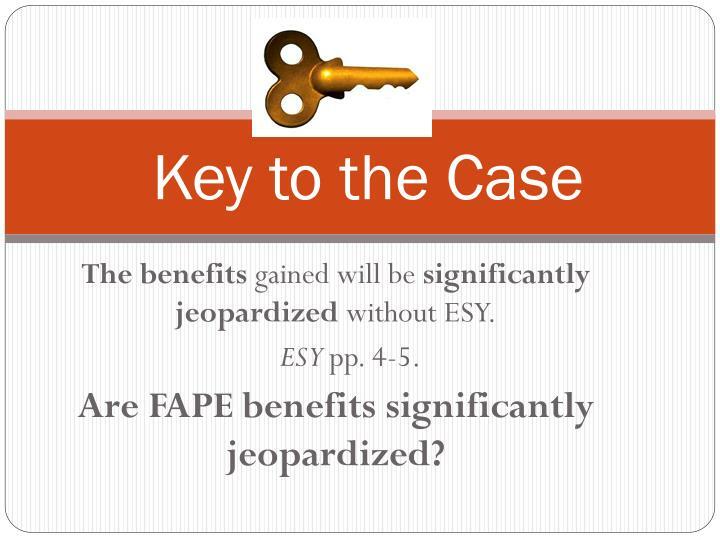 Are FAPE benefits significantly jeopardized? 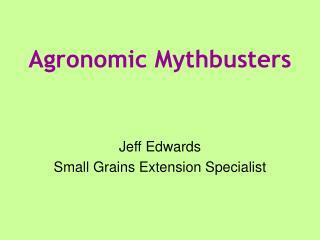 Slow Recoupment that significantly jeopardizes . . . 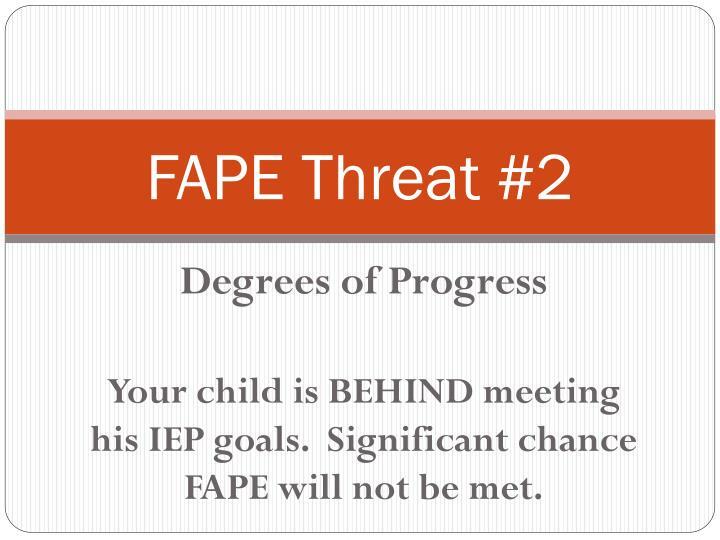 Your child is BEHIND meeting his IEP goals. Significant chance FAPE will not be met. your child improved but. 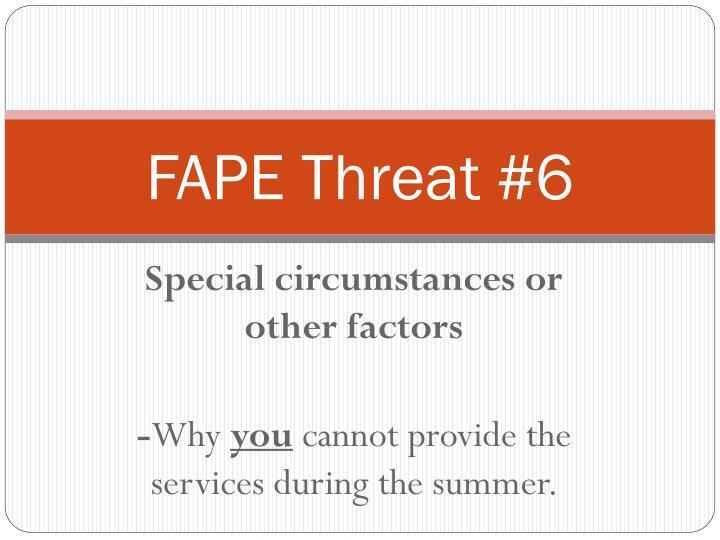 . .
-Why you cannot provide the services during the summer. 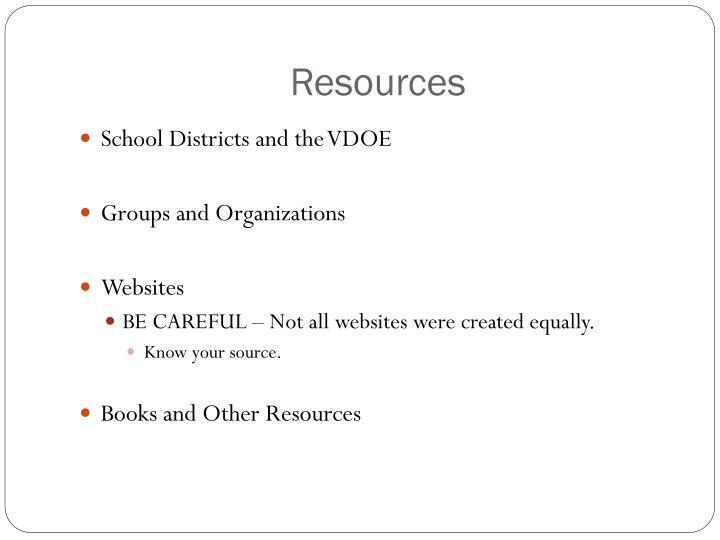 BE CAREFUL – Not all websites were created equally. 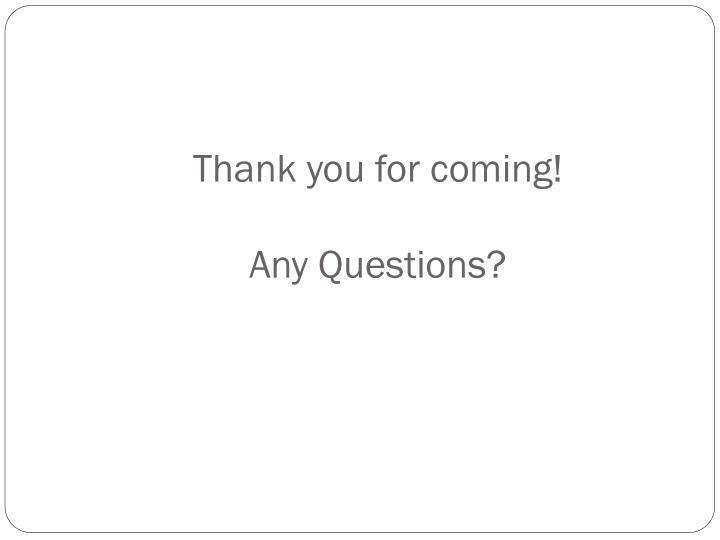 Thank you for coming!Any Questions? 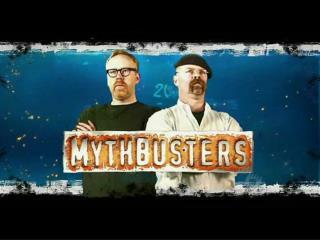 Mythbusters -. 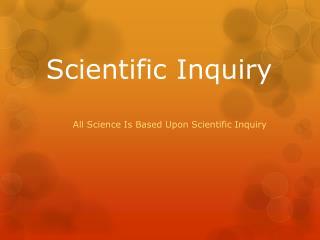 goals: to use scientific inquiry in evaluating a scientific statement or question to apply the scientific method in solving a problem. mythbusters. 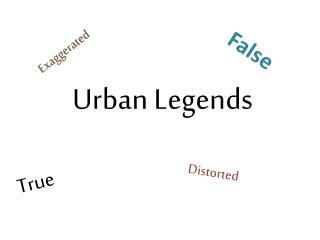 Urban Legends -False . 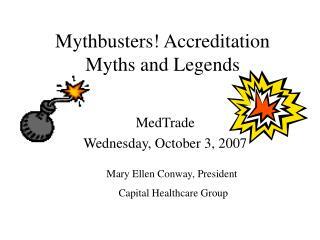 urban legends. exaggerated. true . distorted . 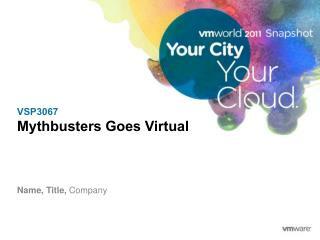 urban legends. 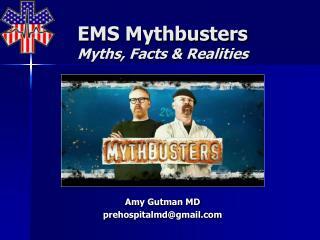 urban legends are usually shocking, weird or funny tales. 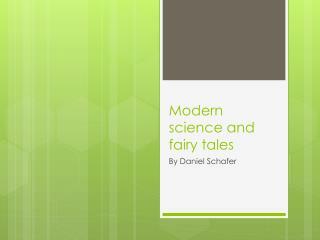 these tales are retold numerous times because most people believe that they are true.